Printer Hub is the print data conversion and transfer function at a TM-Intelligent printer, for the print data. 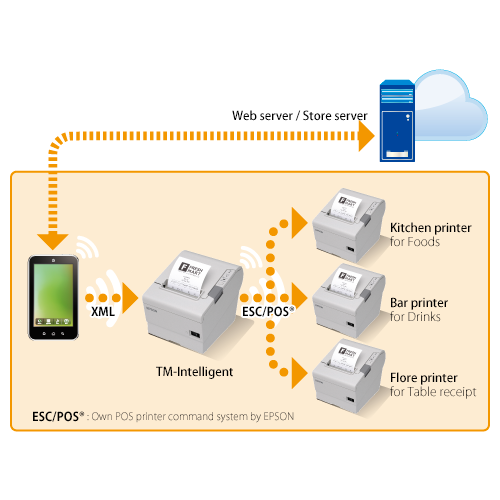 With this function, an application can send the print data in XML data not only to a TM-Intelligent printer but also normal TM printers, which are connected to the TM-Intelligent printer through Wi-Fi or Ethernet. When a TM-Intelligent printer receives XML print data from an application, which is running at a PC, a tablet PC, or another mobile device, then the data is pointing not to its own printer ID, but to another external printer ID, that has been configured by TMNet WebConfig, the TM-Intelligent printer converts the print data from XML data to ESC/POS command data, then transfers it to the target printer. Using this function, you can control multiple TM printers at an application through one TM-Intelligent printer. This gives you flexible printer configurations to meet the customer's requirement for the Tablet POS system at retail or hospitality market. One TM-Intelligent printer can control up to 20 TM printers in the same network.